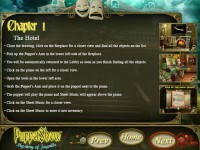 Use our Strategy Guide to uncover dark secrets, find hidden clues, and solve nefarious puzzles, in PuppetShow: Mystery of Joyville. 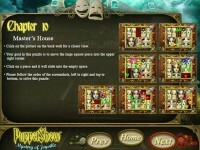 The puppet show in Joyville was once a wondrous attraction until the great fire. Now, rusted gears and dark mysteries lay within strange machinations and disheveled puppets. A young boy, Simon, is the most recent in a long line of missing people. Use our handy Strategy Guide to solve nefarious puzzles, find hidden clues, and uncover the dark secrets of a town that is anything but joyful. Solve puzzles and uncover dark secrets. 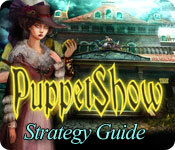 Tell someone about PuppetShow: Mystery of Joyville Strategy Guide Game! AWOxiV Really appreciate you sharing this article.Much thanks again. Great. JhXxmd Awesome blog article.Much thanks again. Keep writing. T3JL0A I appreciate you sharing this blog article.Much thanks again. Awesome.